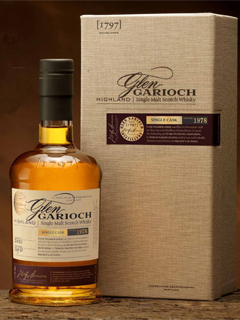 In November 2012 Milroy’s of Soho proudly launched a rare bottling of 33 year-old Glen Garioch single malt, having visited Scotland’s most easterly distillery earlier in June. This is the latest in a long tradition at Milroy’s of Soho of selecting single casks by hand, and a welcome addition to our range of collectible and scarce bottlings. Below is our account of how number 10999 became the chosen cask, yielding just 146 bottles. Back in June we were sent on a secret mission to Glen Garioch; one of Scotland’s oldest distilleries, founded in 1797. Distillery Manager Kenny Grant (son of previous manager ‘Digger’ Grant – so named because he had a digger) gave us the grand tour, through the barns with their malting floors, a large mash tun and washbacks, before entering the distillery warehouses, filled with rows of casks stacked high on top of one another, containing slowly maturing whisky. We went to Glen Garioch in search of a very special bottling that we could proudly present to our knowledgeable and discerning customers; something remarkable, supremely elegant, and with such complexity as to reveal extraordinary flavours with every sip. It should reward lengthy contemplation. Our aim was not driven by concern for budget or profit margin, nor did we have a marketing campaign in mind. We were simply looking for something a little different – certainly not a one-dimensional crowd-pleasing blockbuster – something that would delight true whisky enthusiasts. We found our answer in Glen Garioch 1978 cask no.10999; this little gem takes its time to open up, but when it does its subtle complexity is mind-boggling, packed with revelatory moments. This is a connoisseur’s dram: pour yourself a glass and experience something rather different from the mainstream. new paint, esters/banana, pineapple, sweet sherbet! A superb dram [hard not to be at CS], zingy, spicy, fruity and pleasantly woody, very characterful indeed.